Histopathologic image of myxoid liposarcoma arising in the deep soft tissue of the thigh. H & E stain. 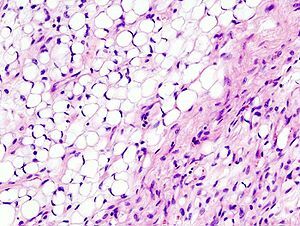 A myxoid liposarcoma is a malignant adipose tissue neoplasm of myxoid appearance histologically. Myxoid liposarcomas are the second-most common type of liposarcoma, representing 30–40% of all liposarcomas in the limbs, occurring most commonly in the legs, particularly the thigh, followed by the buttocks, retroperitoneum, trunk, ankle, proximal limb girdle, head and neck, and wrist. They occur in the intermuscular fascial planes or deep-seated areas. They present as a large, slow-growing, painless mass. They are associated with a fusion between DDIT3 or "CHOP" (at 12q13.1-q13.2) and FUS or "TLS" (at 16p11.2) or EWS (at 22q12.2). The specific translocation of FUS-DDIT3 is t(12;16)(q13;p11). ^ Sung; et al. (2000). "Myxoid Liposarcoma: Appearance at MR Imaging with Histologic Correlation". RadioGraphics. 20 (4): 1007–1019. doi:10.1148/radiographics.20.4.g00jl021007. PMID 10903690. ^ Rabbitts TH, Forster A, Larson R, Nathan P (1993). "Fusion of the dominant negative transcription regulator CHOP with a novel gene FUS by translocation t(12;16) in malignant liposarcoma". Nat. Genet. 4 (2): 175–80. doi:10.1038/ng0693-175. PMID 7503811. ^ Crozat A, Aman P, Mandahl N, Ron D (1993). "Fusion of CHOP to a novel RNA-binding protein in human myxoid liposarcoma". Nature. 363 (6430): 640–4. Bibcode:1993Natur.363..640C. doi:10.1038/363640a0. PMID 8510758. ^ Forni C, Minuzzo M, Virdis E, et al. (February 2009). "Trabectedin (ET-743) promotes differentiation in myxoid liposarcoma tumors". Mol. Cancer Ther. 8 (2): 449–57. doi:10.1158/1535-7163.MCT-08-0848. PMID 19190116. ^ Aman P, Ron D, Mandahl N, et al. (1993). "Rearrangement of the transcription factor gene CHOP in myxoid liposarcomas with t(12;16)(q13;p11)". Genes Chromosomes Cancer. 5 (4): 278–85. doi:10.1002/gcc.2870050403. PMID 1283316. ^ Göransson M, Andersson MK, Forni C, et al. (January 2009). "The myxoid liposarcoma FUS-DDIT3 fusion oncoprotein deregulates NF-kappaB target genes by interaction with NFKBIZ". Oncogene. 28 (2): 270–8. doi:10.1038/onc.2008.378. PMID 18850010. This page was last edited on 7 February 2019, at 13:01 (UTC).